Teir has spent the majority of his life as a loner, going where he pleased, when he pleased, beholden to no one. That all changed when Chieftess Ember and her Wolfriders accidentally stumbled upon his home on the plains of Djunsland in their quest to find a new Holt away from the threat of humans. Abandoned by his mother Kahvi as an infant, Teir was raised by nomadic descendants of scattered Go-Backs. He grew up with only his adopted father for family. The two sometimes encountered small bands of elves or loners coming and going, but never formed any lasting connections. So, while he welcomed the Wolfriders, he kept his distance with no expectation of any permanent bond with them. Before long, however, Teir found himself embroiled in the Wolfrider’s fight for survival, and ultimately opened up and joined the tribe–in no small part because of his mutual attraction to Ember. Spending the majority of his life alone, Teir has a natural affinity for animals, his only company. From his adopted father he developed the skill of imitating animal movements and cloaking himself in their very essence, so much so that he can pass among them without arousing their fear. He also has an innate magical ability to instantly bond with and psychically guide animals that even he seemed to be unaware of and that was subtle enough that the Wolfriders didn’t detect it when they first met him. Never before having a tribe to call his own, Teir is not naturally a talker and keeps his thoughts and emotions to himself. He is close-lipped about his past and harbors great anxiety and fear of abandonment, after having been left behind by Kahvi and so many others in his youth. The combination of this deep emotional trauma and Teir’s habit of bottling things up leaves him prone to brooding and even depression. He is something of a disaster-thinker, always keyed up, always waiting for any good thing that comes his way to go up in smoke. Teir’s over-emotional personality leaves him vulnerable and he often overcompensates for it. He makes decisions from his heart, not his head, and can be overprotective and impulsive. Sometimes he misses truths that are right under his nose, and his Go-Back heritage means he sometimes has to be hit over the head before he gets the big picture. As a result, he can make rash decisions that put him in danger and get him in trouble with Ember. Yet he is brave, compassionate and deeply insightful. When he lets his emotional defenses down, he loves hugely and passionately, like each time’s the end of the world. He is intensely loyal to Ember. His emotional immaturity means Teir needs looking after, which Ember is more than happy to do. 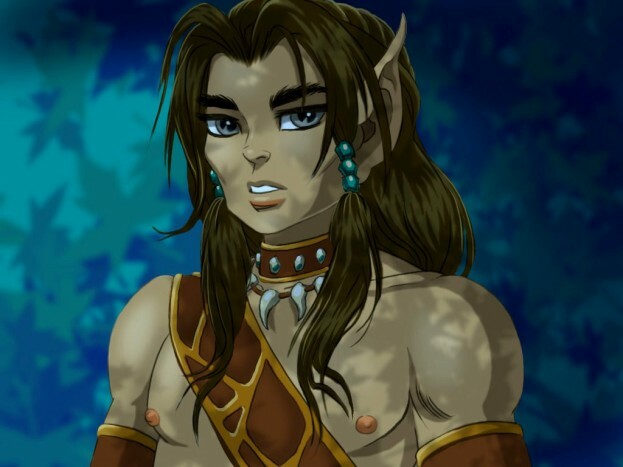 After learning his true heritage, Teir confronted Kahvi, and was faced with the realization that his lifelong pain at being abandoned failed to impress her. Yet, he has suddenly found himself surrounded by his birth father Windkin, his grandmother and cousins. How the sudden realization that he does indeed “belong” to a family will affect Teir remains to be seen. Teir Recognized Ember and while the two are now lifemates, they’ve chosen to forgo having a cub (for now, at least) with the magical aide of Leetah and Mender.